Deburring and polishing work, etc. It is solid and very easy to use. But I wonder if there is a pocket pointing to the pen. This review is about item#37316045. The waist strings are thick and can not be tied at the back, neck strings can be fitted with a plastic one-touch, I wanted the same hip strings. I think that the fabric is also durable in moderate size. The front pocket is convenient, but machining powder may get in, so it is better to have a lid. I thought conveniently that the belt was a way to be stopped by magic. It is thick and very good, but the plastic adjustment parts attached to the neck string should be a little smaller. (Heavy, when you wash it rattles noisy) Because it is used for polishing work pocket part is caught, it gets frayed. I purchased several kinds, but I said that this is good and I tried it this time. It is better if it is a bit cheaper. I like wearing and simple design very much. Speaking of greed, I think whether you should lower the price a little more. I think the location and number of pockets are also functional and thoughtful. I think that I would like to repeat, thank you very much. It seems that it can be used for a long time by sewing fabric that was thick and thick. The size is also sufficient. The unisex item was short in length and the pants were dirty. This is because the knees are hidden length even for men with a height of 170 cm, so the pants become less dirty. I am using it for the cleaning of the garden and the field work. It was even better if the pocket was not the front but the side. I purchased it because I used water because I wanted an apron with a waterproof effect. 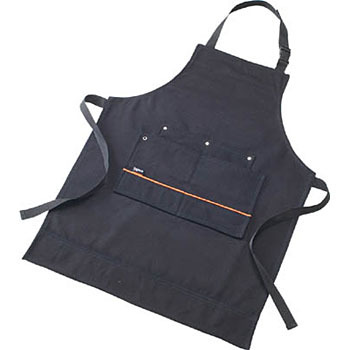 This apron has a thickness, it seems not to be completely waterproof, but it is very handy because water can not immerse.